Florida’s top agriculture official wants more funding to fight wildfires. Firefighters worked hard to control this year’s burns, before heavy rainfall cut the season short. But winter weather conditions could fuel more fires in 2018. Agriculture Commissioner Adam Putnam says potential fire risks are increasing. “It’s anticipated that we will have a drier winter. And with all the fuel on the ground because of the hurricanes we could have a very busy fire season next year,” Putnam said. Putnam is asking Governor Rick Scott for $11 million to get ready for what could be another aggressive fire season. “Because of the up tempo and the wear and tear on our equipment, we need to get ready for next season, next wildfire season. And we’ve got some significant asks in there on wildfire equipment as well,” Putnam said. 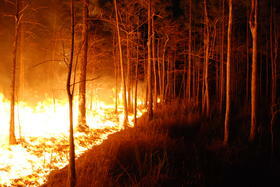 Florida’s peak fire season runs from late winter into spring, but fires can spark any time of year. There are currently three wildfires burning in the state.